In 1580s Oxford debates concerning the relative merits or vices of music were intensifying. Ex-Oxford student Stephen Gosson had attacked music in his School of Abuse (1579) encouraging his readers to eschew practical music and look instead to the harmonious delights of heaven: ‘If you will be good scholers, and profit well in the Art of Music, shut your fiddles in their cases, and look up to heaven: the order of the Spheres, the unfallible motion of the Planets’. The newly appointed and (by his own admission) musically ignorant Lecturer in Music, Matthew Gwinne, responded in his inaugural lecture, ‘In laudem musices oratio’, (1582), exhorting his listeners to ‘show yourselves men of good will, expel music’s enemies, hold them in contempt; cherish its patrons’. Published defences soon followed with the anonymous The Praise of Music (1586) and Apologia musices (1588) by former Fellow of St John’s College, John Case. 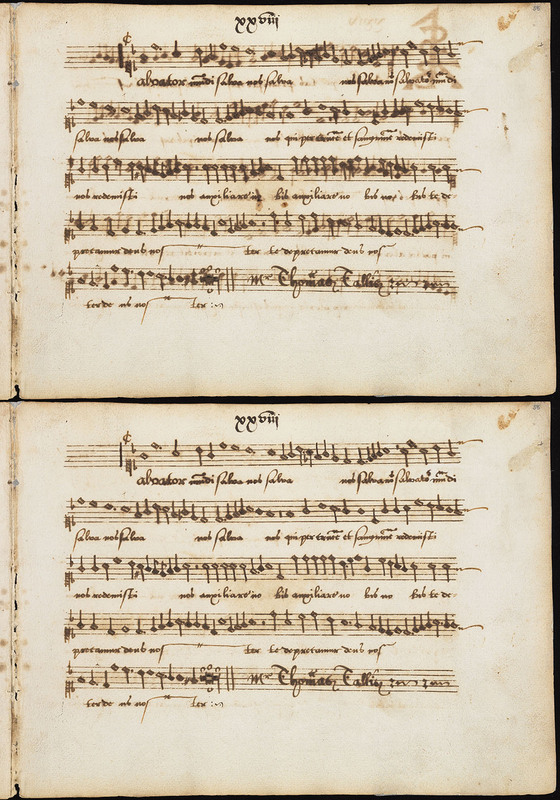 In the midst of this debate Robert Dow – a Fellow of Laws at All Souls College, Oxford and a teacher of penmanship – began copying a set of musical partbooks (where every voice part is copied into its own book) containing Latin motets, English anthems, consort songs and textless music. They survive today in Christ Church Library, Oxford (Mus. 979-83). These music books (available to view online via DIAMM) were designed not merely to be functional in communicating musical notation to players, but also to be both witty and visually appealing. Each book begins with a Latin poem in praise of music by Walter Haddon, at one time President of Magdalen College, followed by Latin verse requesting that users treat his books with care and several quotations attesting to the value and joys of music. These Latin inscriptions continue throughout the motet section of the partbooks. Many of them praise particular composers, including Thomas Tallis, William Byrd, Robert White, William Mundy and Robert Parsons. A few promote the quality of English music, while many others cite myths and commonplaces about the benefits or nature of music. Dow’s combination of notation and inscription presents a rare and intriguing meeting point of musical thought and practice, offering insights into the motivations and philosophies of this amateur Elizabethan musician. Whether or not Dow had a specific meaning in mind for each juxtaposition, in a culture used to emblems, allegory, and witty conceits these inscriptions would have invited users to reflect on the connections between the musical debates evoked by the quotation and the musical practice represented by the notation and its performance. Some of the connections between the motet and its accompanying inscription are clear. William Byrd’s motet Tribulatio proxima est (first line: ‘Tribulation is very near: for there is none to help me’) is paired with a line that translates as ‘Music is the medicine of the sad mind’. The inscription draws on the commonly held belief that music was a cure for melancholy and by pairing the motet and inscription Dow raises the suggestion that singing motets of lamentation like Byrd’s could have therapeutic properties. Dow’s intention to praise and justify music is clear through these and the many other inscriptions he copied (discussed more fully in the article linked to below). He made no attempt to provide balanced statements on music’s virtues or vices, and chose numerous quotations explicitly condemning music’s detractors. The stories and arguments raised by his choice of quotations are wholly conventional and influenced by the rhetoric of other contemporary encomia. Yet his justification is founded primarily on the pleasurable, moral and religious advantages of musicality, inviting reflection on the roles music might play in Christian living, honest pleasures and ultimately salvation. Where Dow’s partbooks are most distinctive is in prompting the users of his books to consider how singing these motets might bring specific benefits. With the inscriptions interspersed throughout the books, performers would stumble across them in the course of playing, potentially prompting communal discussions of music’s effects in relation to the motets just sung. In his Plain and Easy Introduction to Music, the composer Thomas Morley would describe the motet as a ‘grave and sober’ genre of the highest art that ‘causeth most strange effects in the hearer’, drawing them to devout contemplation of God. Dow’s juxtapositions similarly suggest that one might sing these motets to achieve the beneficial effects alluded to in the inscriptions. Moreover Morley argues that such effects would be most powerfully felt by the ‘skilful auditor’ – presumably musically educated men like Dow. Engaging communally with the multimedia contents of these partbooks Dow and his co-performers could cultivate both their performance abilities and those esteemed skills of musical knowledge, judgement and reasoning, seeking ultimately to reap the benefits of the powers of music. To read the full article published by the Early Music journal visit: https://academic.oup.com/em/article-lookup/doi/10.1093/em/cax006 (open access). Are you into early music, Renaissance manuscripts or using Photoshop to improve digital images? If any of theme applies to you, then you might enjoy getting involved with two of Tudor Partbooks’s most exciting projects to reconstruct Tudor music manuscripts. We have c.600 images in need of restoration, which we estimate will take a couple of thousand hours to complete. So we’re looking to recruit a large team of volunteers who would like to learn the process of digital reconstruction and have a go at restoring some of these manuscript pages. No previous experience is necessary as I’ve created a series of videos to teach the few basic techniques that are needed. These also explain the aesthetics of the reconstruction process: how to we decide what to to remove or leave in, and how do we try to maintain the look of a 400-year-old manuscript? This first video is an introduction to some basic Photoshop tools and the settings you’ll need to enable for digital reconstruction. (The videos currently show the process via Adobe Photoshop CS6, however, the same digital reconstruction techniques are possible with Adobe Photoshop Elements). Now you’re ready to have a go! Email Julia to request your first image, along with any questions you might still have. Before we can start each piece, we need have to transcribe the music from the remaining partbooks. These transcriptions are then used for making the reconstructed tenor parts. We’re experimenting with a collaborative process of reconstructing the missing voice that has included performers, students alongside academic specialists. As part of this we’ve held some reconstruction workshop weekends (you can see Storifys of previous workshops in Oxford and Cambridge, while the next is forthcoming in Newcastle in March). So if you read sixteenth-century music notation and/or are good with Sibelius music software there are two ways that you could help in reconstructing Baldwin’s partbooks: firstly, by making transcriptions and, secondly, by participating in polyphonic reconstruction. If you’d like to volunteer, or would like guidelines on the Tudor Partbooks house style, just email Magnus. We look forward to welcoming you into our team of volunteers and hope you might enjoy participating in these ground-breaking collaborative projects to reconstruction Tudor music manuscripts. 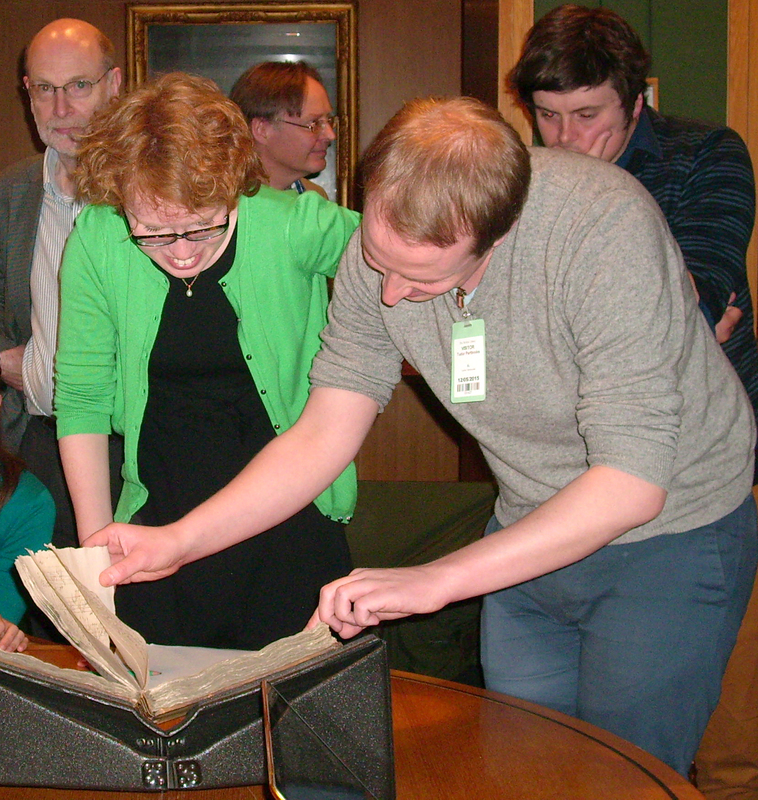 On 12 May a multidisciplinary group of scholars gather to explore and re-examine some the British Library‘s musical partbooks from the reign of Henry VIII as part of the Tudor Partbooks project. Experts introduced the sources and initiated discussion, while manuscripts were available for participants to have a look at. David Skinner started the day with an introduction to Harley 1709, a single surviving partbook from a set containing 26 votive antiphons. Little is known about the origins of the book, which is normally dated to the mid-1520s, though the otherwise unknown composer Thomas Hyllary might provide a clue. Tudor Partbooks PhD student Daisy Gibbs has found records of a Thomas Hyllary from the West Country in the right period. 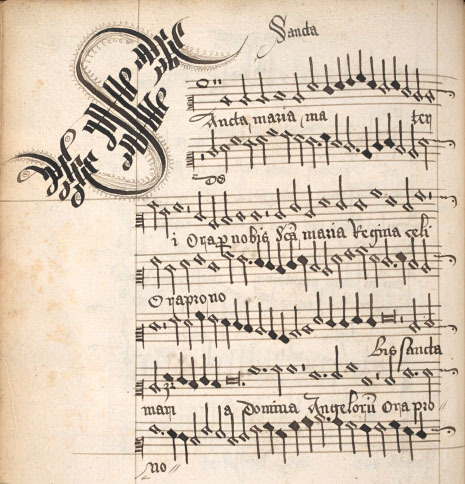 Although the composers of the majority of the music – including Nicholas Ludford, Robert Fayrfax, Richard Davy and William Cornysh- and the manuscript’s strapwork initials suggest a date of c.1515-20, the inclusion of Thomas Tallis’s Salve intemerata presents something of a puzzle and suggests a slightly later dating for the manuscript. Tallis’s birthdate is usually estimated to be c.1505 and Salve intemerata is not his earliest known work (it is more mature than, for example, his Ave Dei patris). Much discussion followed surrounding Tallis’s biography and career. A birthdate of 1505 would make him surprisingly young to have composed such an accomplished piece as Salve intemerata. Was he something of a child prodigy or does our estimated birthdate need revising (making him even older at his known death date in 1585)? Roger Bowers gave an extempore overview of the first known‌record of Tallis’s life in the Dover Priory Account books in 1530/1 suggesting that his role playing the organ and running a choir was a substantial one, not just a job for a talented teenager. This would support a birthdate of c.1500-1505. Further discussion centered around why the music was copied into partbooks (one voice per part) rather than a single large choirbook as was still common at this date, and the extent to which these copies were intended for performance use or were library copies for singers to learn or copy their own parts from. ‌After lunch John Harper turned our attention to Royal Appendix 45-48, a set of partbooks and an organ book from c.1525 containing Nicholas Ludford’s seven Lady Masses. He began with an overview of the liturgical music required to provide the Lady Mass throughout the year and about Ludford’s place of employment St Stephen’s Chapel, Westminster (with valuable contributions from the St Stephen’s Chapel Project). However, the books’ leather bindings stamped with the arms of Henry VIII and Catherine of Aragon, and their appearance in an inventory of the royal library in 1542 (5 years before the dissolution of St Stephen’s Chapel in 1547) open up the possibility that the manuscript may have been a gift to the royal family or else had a courtly function. Harper suggest potential uses in the Queen’s Chapel, perhaps curtailed by the rise of Anne Boleyn in 1533, explaining the unused appearance of the books and their storage in the royal library by 1542. Another alternative was the King’s closet where he held his private devotions, perhaps performed by Philip van Wilder and the Privy Chamber Singers. Yet more possibilities were that the books could have been used by a very small number of singers when the court went on progress, or even by a choir in the household of Princess Mary. ‌In the final session of the day John Milsom introduced us to the remains of the earliest English printed set of partbooks, known as the Twenty Songs (1530). The one surviving partbook contains a mixture of love songs, Marian devotional songs, textless pieces and some more surprising items including some lewd songs and others in the voice of prostitutes. Our insight into the printing method was heightened by Peter Blayney whose model of a Tudor printing press helped us to understand the process by which these books would have been made. Several mysteries surround these books. Firstly, they are printed in using the expensive double impression method (where the staves were printed first, and then the music printed over the top), even though the more efficient single impression methods had already been in use in England on single sheet music publication since the 1520s. Secondly, who was the printer and where did they get their music type from? The music type may have been of German origin as it contains natural symbols that were not typically used in English music notation. The highly accurate music type-setting suggest that it was set by a musician and probably an Englishman (due to the different continental and English conventions for the placement of dots after notes).‌The publisher was possibly John Heywood who had links to the Rastall family whose type was used for the text. Finally, how do we explain both the huge expense outlaid in casting a music fount which was used in only one extant book, and the long gap between this publication and the English printed polyphonic music books in the 1570s? As only one in five printed books from this period survives complete, could this high attrition rate be masking the existence of both earlier and later printed polyphonic music books in early Tudor England? 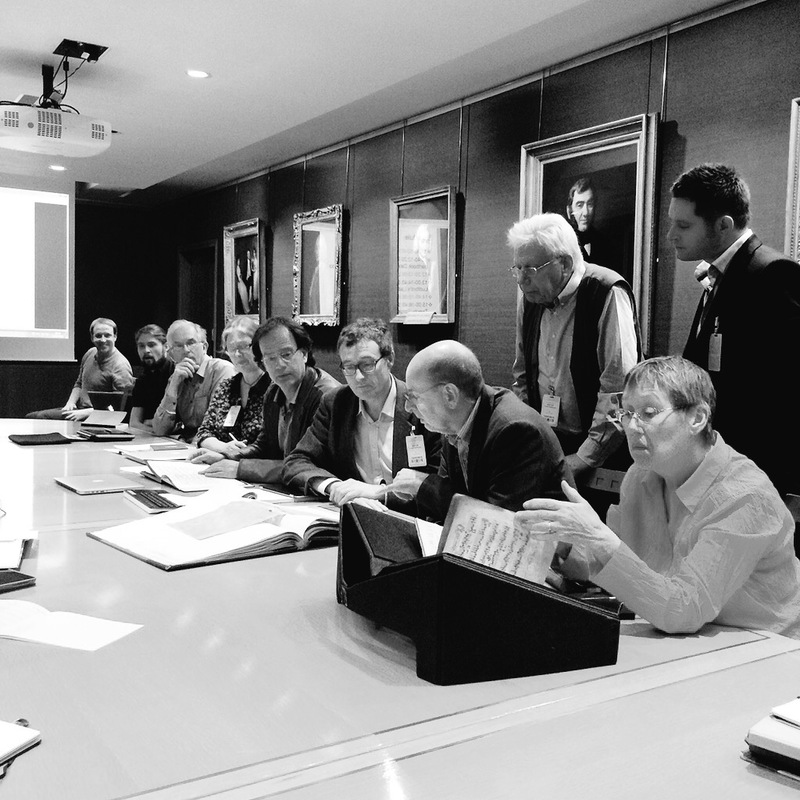 It is difficult to capture to the range of discussion that took place throughout the day both formally during the session and informally as we circulated and viewed the various manuscripts and printed books. Inevitably these discussions raised as many questions as they answered, but the study day has opened up many new avenues for consideration and further research. 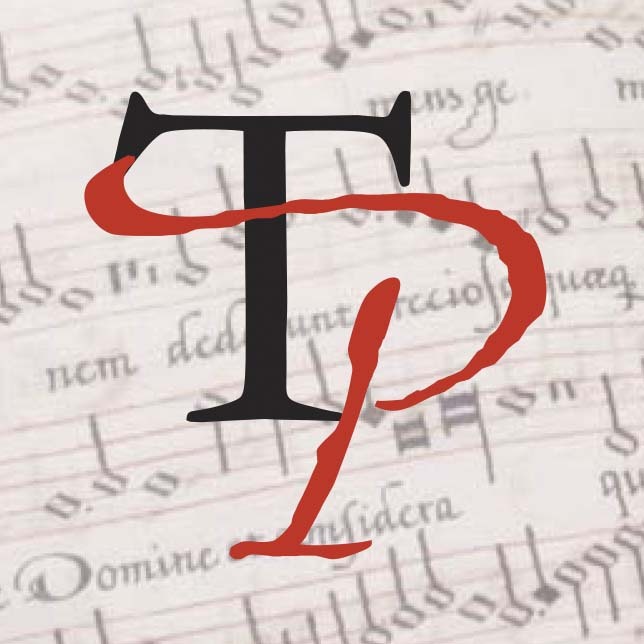 The next Tudor Partbooks study day will be held at Christ Church, Oxford, on 19 November and will focus upon the interaction of manuscript and printed music as exemplified by the Baldwin partbooks, GB-Och: Mus. 979-983.